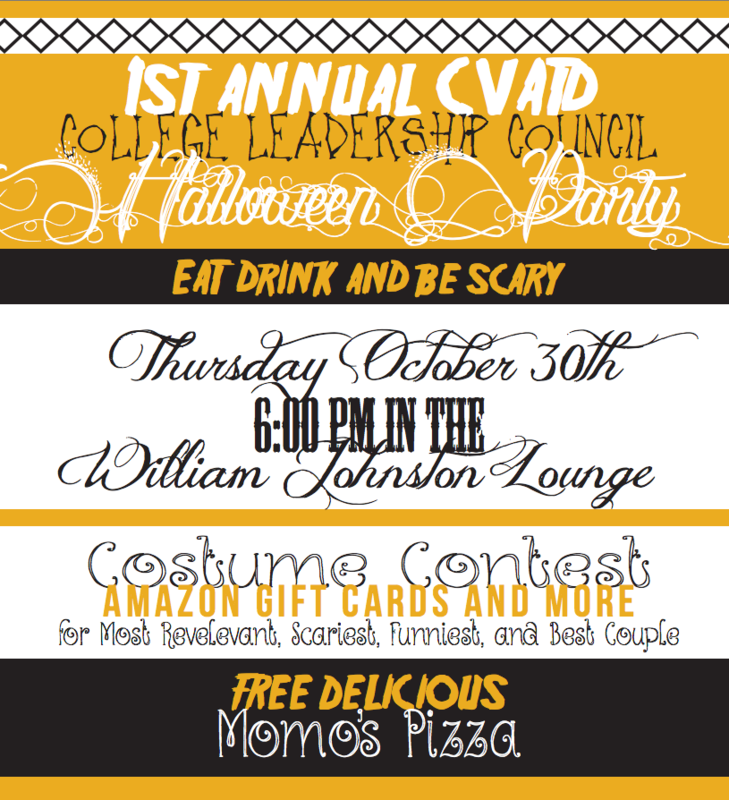 Join us for a spooky gathering on October 30, 2014 from 6pm – 8pm in the lobby at the William Johnston Building. This is the College Leadership Council (CLC)’s first event this year and a great opportunity to come mingle with students from all the departments across the college. Eat, drink and be scary. Costumes are encouraged: Prizes will be awarded to the best costumes of the night! (Amazon gift cards and more) For most relevant, scariest, funniest, and best couple. 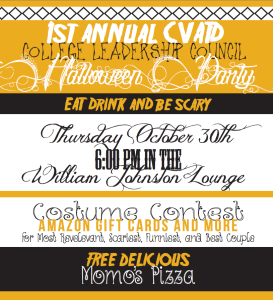 There will also be FREE Momo’s Pizza, soft drinks and candy too! Meet someone new and have fun while you’re at it! The College seeks to create, teach, learn, and serve with passion and intellectual rigor. The College is guided by a set of values that demonstrates a commitment to students, faculty, the University, the community at large, and the organizations that will employ future graduates. The council consists of a maximum of two undergraduate and one graduate student from each of the College of Visual Art, Theatre, and Dance’s six departments. The CLC uses SGA affiliated funds to promote interaction between the college’s students and highlight the impact our college is making through out Florida State University, the city of Tallahassee and also through out the rest of the state of Florida. The CLC encourages interdisciplinary communication and artistic collaboration between the colleges and departments. It is their belief that multidisciplinary cooperation will make us stronger, better artists and work toward a more substantial college.